From longtime bestselling author Jim George--a concise, simple, easy-to-remember survey of each book of the Bible in a highly portable format! 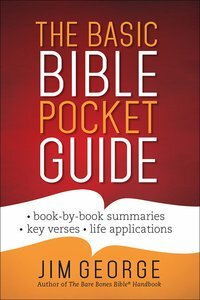 The Basic Bible Pocket Guide offers two outstanding benefits: A straight-to-the-point summary of each book in God's Word and a panoramic overview of all the Bible's high points from beginning to end. Its convenient size also makes it perfect for constant reference everywhere you go. You may even find yourself wanting extra copies to give to others! About "The Basic Bible Pocket Guide"
Jim George and his wife, Elizabeth George, are Christian authors and speakers. Jim, author of A Husband After Gods Own Heart (a Gold Medallion finalist) and The Bare Bones Bible Handbook, has M.Div. and Th.M. degrees from Talbot Theological Seminary. He has served in various pastoral roles for 25 years and on The Masters Seminary staff for 10 years. Jim and Elizabeth have two married daughters and are grandparents.